Tigger has been learning about different pets at school. How to care for them, what their likes and dislikes are and how they have to visit the Vet like we would visit the doctor. Discussing his project at home the question of what do other animals do when they are poorly arose, especially about Tigers and bears etc. I’ll hold my hands up and say I had no idea, so went in search of a book to help us all understand how animals heal themselves and came across a new book called Animal Doctors: Incredible Ways Animals Heal Themselves. See how different animals keep themselves and their children healthy with anti-toxic clay, seedpod nit combs, antiseptic saliva, UV-protection mudbaths and insect-repelling pastes. Each double page is dedicated to an animal and gives you the low down on who they are, what they eat, their behaviour and details how they heal themselves from ailments on a fold out flap. Each different animal included within the book has their own way of healing themselves. From the African Elephant bringing on birth, to the Chimpanzee gut cleansing and the Wood Ant’s nest disinfection. As I sat down with the children to look through this book for the first time I was quite impressed with the range of different animals included. From the domestic dog to the Mountain Gorilla, it had an animal to interest everyone. The illustrations really make this book come alive. The sketch like images make the pages look inviting and not overly cartoon like (if that makes sense). A great book to help show how animal can be their own doctors at times. The Animal Doctors: Incredible Ways Animals Heal Themselves book is released today, with a £10.95 RRP for a hardback edition. Available to buy from Amazon and all other good book retailers. 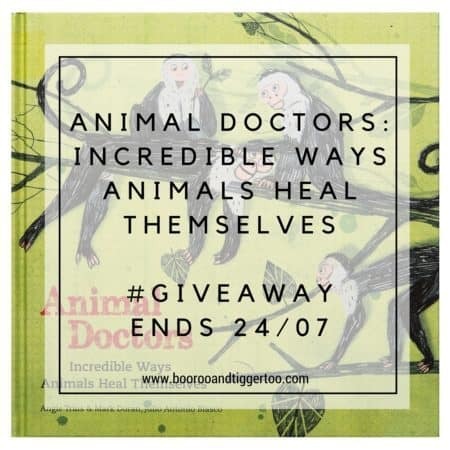 To celebrate the release of Animal Doctors: Incredible Ways Animals Heal Themselves, Boo Roo and Tigger Too are lucky enough to have three copies of the book to giveaway.